Glasses have become a true statement piece in the style world. What used to be equated with ‘nerd status’, are now at the height of trendiness, which is great news for those of us with bad eyesight. In high school, I pretended to be able to see clearly for as long as I could, but when I had to sit at the front of the room to see the chalkboard (and still had trouble), I knew something had to give! I was embarrassed to wear glasses until they became mainstream chic, and now I’m always so excited to incorporate them into my look on the days I wear them. But when it comes to applying makeup with glasses, it can be a struggle. If you want to know some of the best tips for applying makeup with glasses, read on! Glasses can change your entire look, and if you know how to rock them, you’ll end up looking as chic as ever. Here are a few rules to live by when wearing makeup with glasses. Add definition to your eyes from behind the lenses by applying eyeliner to your upper and lower lids. Use a gel liner on the top and a thin swipe of powder eyeliner on the bottom to draw attention to your gorgeous eyes. If you wear glasses, you know they have a tendency to slip down the bridge of your nose. To keep this from happening, dab a pinch of eyeshadow primer (NOT foundation primer) on the area, and voila, problem solved! Old, expired mascara can flake onto your glasses, which is never a good look. To keep this from happening, make sure your mascara is always fresh! Never use mascara for over three months after its been opened, and opt for a creamy, waterproof mascara to prevent your lashes from sticking to your glasses. The focus will naturally be on your eyes when you’re wearing glasses, but to change things up, add a bright lipstick to make some impact. A lip that pops looks amazing paired with glasses and brightens your face all around. Try a product like the Chanel Rouge Allure lip color in Eblouissante for maximum impact. One of the biggest issues with applying makeup before you put on your glasses is that you can’t see very well. To make the process easier, invest in a magnifying mirror so you can actually see what you’re doing! Although you may think that glasses take the place of your brows in framing your face, you shouldn’t be neglecting them. Groomed, filled in brows that peak out from behind your glasses will really frame your face and make you look even more polished. The longer the brush handle, the flimsier you hold it, and the harder it is to apply makeup. Seeing that it’s already tough to apply eye makeup with glasses, investing in short-handled brushes like this one will make all the difference. They’ll allow you to get a better grip so you can apply your makeup more precisely. The makeup around your eyes tends to get a little sweatier when you’re wearing frames. Combat this issue by sealing your makeup with a setting spray so it lasts all day! When applying mascara, focus on volume rather than length. You don’t want your lashes to be so long that they hit the frames of your glasses, so instead use an eyelash curler and focus on adding volume at the root of your lashes. This video is loaded with amazing tips for what to do and what to avoid when wearing makeup with glasses. From setting your foundation in place with powder to using the right colour of eye shadow to emphasize your eyes, she has tons of tips on eye makeup for glasses wearers. I love this tutorial because she teaches you how to make your eyes look bigger with makeup so that they really pop behind your glasses. She uses the Tarte Shaping Palette for her eye shadow makeup and the Ardelle Demi Wispie Lashes to enhance her look even more! If you need a look that’s a little more glam, you’re going to love this step-by-step tutorial. She goes for a jewel-toned smokey eye look, using the Morphe 35P Palette and conceals her under eyes with the Urban Decay Naked Skin Concealer for a flawless look that stays on under your frames. This tutorial is great if you want natural, yet gorgeous eye looks for when you’re wearing glasses. She shows you how to create two looks – one where the makeup if more heavy on the top lid and one where the makeup’s more heavy on the bottom. One of my favourite part of both looks are her brows. She uses the Benefit Goof Proof Brow Pencil and the Benefit Gimme Brow to really make them pop! I love this everyday makeup look! It’s so simple, but really sophisticated at the same time. She sets her eyelids with the Too Faced Sweet Peach Palette and then finishes the rest of the look with the same palette. The end result is so pretty and makes her eyes look absolutely gorgeous. It’s a great look to rock on a daily basis! If you wear glasses, these application tips will take your look to the next level! Make your eyes pop with these products and tricks! 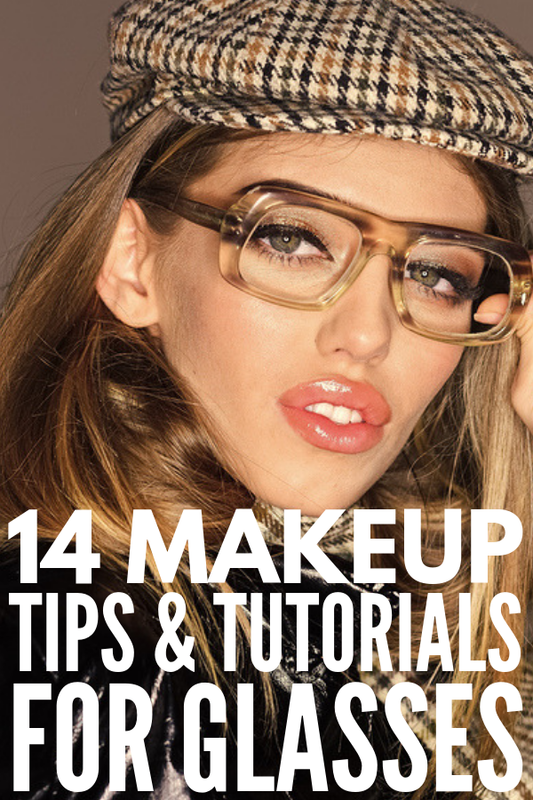 If you loved these tips for makeup with glasses, make sure to share this post on Pinterest!